This year, Autumn *officially* starts on September 23rd, and these kid-friendly autumn events on Whidbey Island are sure to help your little ones embrace this crisp and cozy time of the year! From harvest fairs to Halloween-themed festivities, Whidbey Island has it all—be sure to whip out your calendars so you don’t miss out in 2018! Get ready for a day of food trucks, live music, antique cars, arts and crafts, local produce, wine, and more! Located on the beautiful grounds of Greenbank Farm (built in 1904! ), the Harvest Faire is all about celebrating Whidbey’s rich farming heritage and community. Click here for more details on this family-friendly event. During the month of October, Coupeville is home to some spooky, haunted happenings! In addition to events on specific days, you’ll find “silent sentinels of fall” take up post around the town, and you can pick up a map and vote for your favorite characters at Chamber offices or at the Coupeville library. Click here to read about everything to expect! The main attraction of the day is, of course, the Dog Parade & Costume Contest! Dress up your pooch and parade them in front of the town, with registration beginning at 11am. The day also includes apple pressing and tasting stations—get ready to drink some fresh, delicious cider! Kids can enjoy a bounce house, ghost stories, games, and a special trick-or-treat lane just for children! Click here for all of the details. Dress up in costume or come as you are for this family-friendly parade! Enjoy seeing everyone’s creativity as downtown merchants pass out fun surprises for everyone. 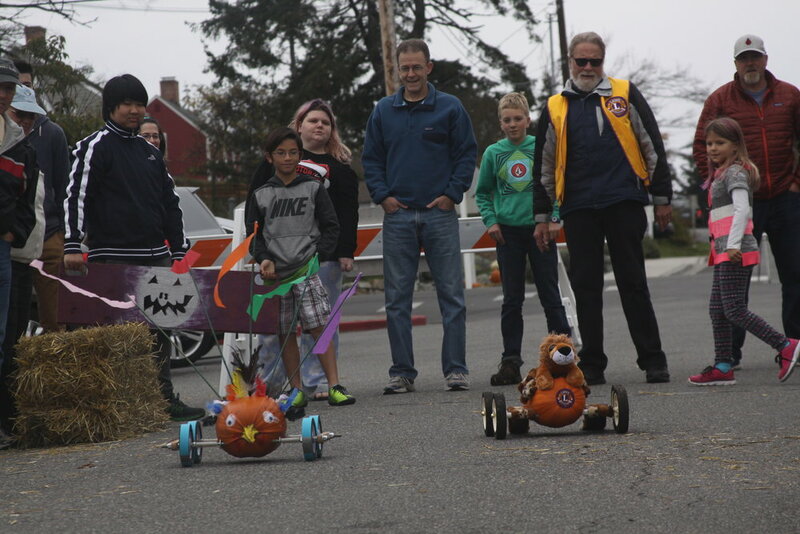 Put wheels on your painted pumpkins and get ready to race ‘em down the street! Come out to see all of the unique creations and see which speedy squash comes in first. Click here for all of the details! Get ready for an afternoon of trick-or-treating with the whole town! Merchants are dressed up in costumes and ready to hand out treats to little ones at this family-friendly community event. Ideal for ages 5 and up, this exciting afternoon is filled with Mexican crafts and a family-friendly movie. Wear your best calavera or Catrina costume!